THAMBO is a theatre production company owned by Roel Twijnstra and Jerry Pooe. It produces theatre production for the main stream theatres often collaborations with partners from SA and The Netherlands projects in 2015 are: MASOTE’s DREAM (PACOFS, Soweto theatre, NAF and Orkater), OFF-SIDE ( PACOFS and “Home Made Productions” ) The HOUSE OF HUNGER ( DUT) and THE GIRLS. For most shows Roel Twijnstra directed, he also designed the set. The last years he is designing for other directors and companies as well. TWIST projects works in the field of Art & Development. We build capacity in community theater groups. We offer a two years programe for selected community theater groups in South-Africa. We do this in combination with established local theater institutes, theater festivals, theaterschools, theater companies, Arts & Herritage centers, local governement and donors. Twist projects in South Africa ( http://www.twistprojects.co.za ) works already succesfull for three years and aims on a sustainable infrastructure for theatre in KwaZulu Natal and has its office in Durban. Its vision is to extend its programme to more Southern African countries. First programs stated in 2014 with Zimbabwe, Mozambique and Malawi. Besides his lectures on theatre schools Roel Twijnstra often gives workshops and masterclasses theatre directing, and work shopping. He lectured on theater schools in the Netherlands (Arnhem, Utrecht and Amsterdam) and abroad (Jakarta, Moscow, New York and Durban). 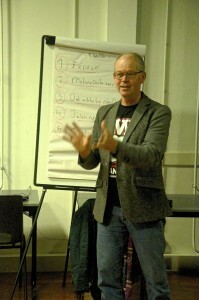 From February 2013 he is lecturing an honors theatre directing course at UKZN-university in Durban and Pietermaritzburg. In January 2014 he facilitated a workshop for mid-carrier directors in Zimbabwe/Harare.